Tickets £8.00 in advance or £10 on the night (if there are any left). Start 7.30pm prompt. Bar, doors and food from 6.45pm. 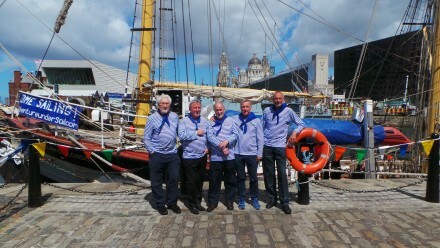 We are delighted to bring these well-seasoned performers of sea shanties and songs of the sea for what promises to be a great night of music and Scouse humour. Port Sunlight Sea Dogs' musical interests are steeped in Merseyside's proud traditions - Maritime, Folk, Irish, and Liverpool's Merseybeat and Skiffle roots, and choir and amateur operatics, All this and more, stirred up in a big panful of Scouse humour. Our great friends on stage will include a set of great songs from the great Hughie Jones (of the Spinners). PLUS Les Bourne and Dave Burrows on guitar, concertina & vocals & Paul Robinson on accordion. Tickets are only £8 in advance from the Big Room Box office (will be £10 on the door). Regular buses to /from Liverpool / Heswall! Bar, bar food and rum rations available. Freshly made Scouse will be sold before the show and during the interval. All profits are for the benefit of Heswall Hall Community Trust and local community projects.